Shorefield Holidays are proud sponsors of Dogstival and to celebrate this partnership we are giving one lucky winner the chance to win weekend accommodation at the fabulous Shorefield Country Park staying in a ‘Pet Friendly Select Lodge’ that can sleep four people and two dogs. 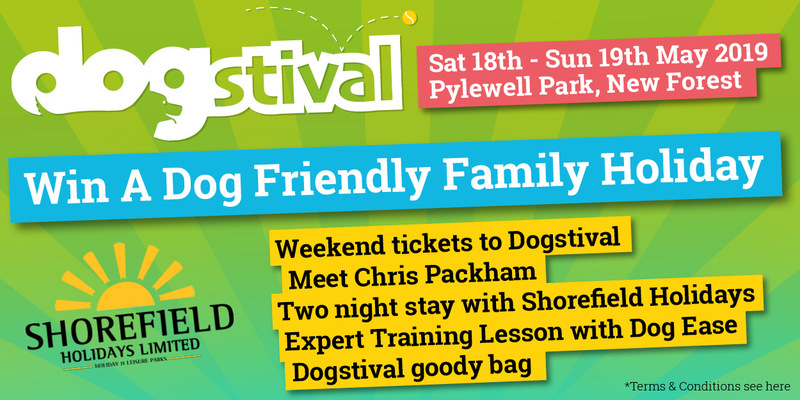 Additionally, you will win tickets to visit Dogstival and get the chance to enjoy a meet and greet with Chris Packham. Facilities at Shorefield Country Park include an indoor swimming pool with sauna and steam room, gym, daily entertainment, Reflections Day Spa, Tides Bar & Grill, amusement arcade for covered fun on rainy days and Wi-Fi across the park to all accommodation. We also have an area of the bar where dogs are welcome and loads of great dog walks on the park and nearby. The winning entrant will recieve weekend tickets for 4 to Dogstival, a two night stay for up to four people and two dogs at a Pet Friendly Select Lodge at Shorefield Country Park, a meet and greet with Chris Packham and a Dogstival goodie bag. Shorefield Holidays booking terms and conditions are applicable.